Bagels and caffeine. What could be better? Step aside, rainbow bagels. There’s a new sheriff in town, and he’s caffeinated. Who needs a sugary, rainbow confection when you can get caffeinated bagels as black as your soul packed with espresso buzz? This new caffeinated bagel comes from the gentlemen of Einstein Brothers Bagel chain. This is the world’s very first caffeinated bagel, and it launched last Thursday under the apt name “Espresso Buzz Bagel.” Each bagel contains 32 milligrams of caffeine, which translates to approximately one third of the amount in an 8-ounce cup of coffee. According to chain’s site, the Espresso Buzz Bagel also contains 13 grams of protein, as well as iron and magnesium. “Every bite of our Espresso Buzz Bagel gives you a tasty dose of bold flavor, caffeine and one-of-a-kind benefits,” says the website. The Espresso Buzz Bagel was launched as part of the National Nurses Week campaign. If you’re a nurse, head over to any Einstein Bros. location and you can score a free Espresso Buzz Bagel and cream cheese (and as a nurse, you’ll definitely appreciate the extra caffeine). But how did this strange, goth bagel come to fruition? By studying millennials, of course. “We have watched the coffee category expand and adapt as Millennials converted to coffee drinkers, attracted by the smoother flavor and artisanal characteristics and third- and fourth-wave coffee,” said Kerry Coyne, Einstein Bros. senior vice president and head of marketing and research and development, in an email interview with Fox News. So how does the actual bagel taste? Testers from the Fox News article were split. Some said it was terrible—“It’s insanely bitter,” said one tester who couldn’t decide if eating it plain or with cream cheese would make it better. Other testers were definitely into it. “I love coffee and I love this. I just wish I had some [coffee] to drink along with it,” said another tester. 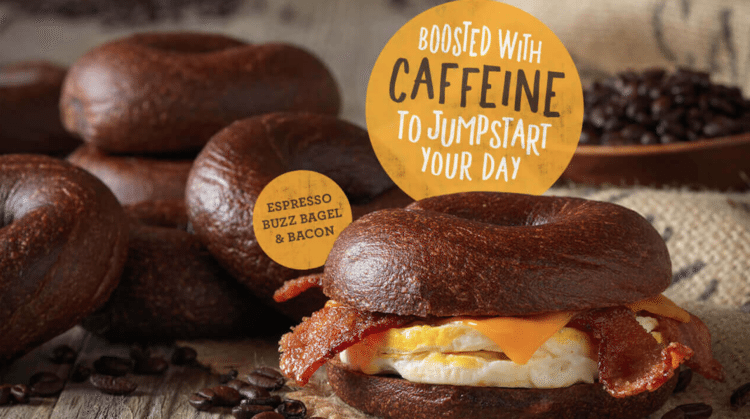 If you’re really hungry, Einstein Bros. is offering the caffeinated bagels as part of a breakfast sandwich: The Espresso Buzz Bagel is topped with brown sugar thick-cut bacon, cage-free eggs, cheddar and butter for a snack that the company says “will energize your morning” (or put you to sleep under your desk). Would you try this buzzy bagel, or do you prefer to stick to your cappuccino?